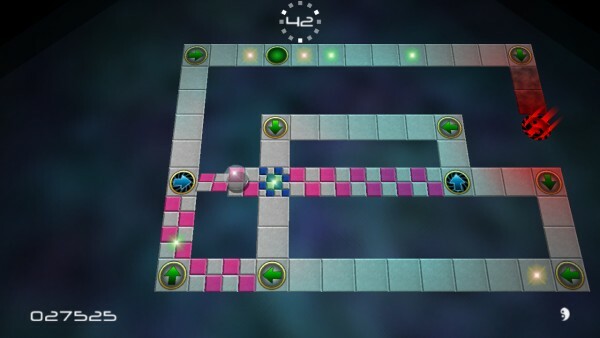 Remastered for 2019, Yinyang is a unique puzzle adventure game starring a heroic ball. Your girlfriend, Yin, has been kidnapped by the forces of chaos and it is up to you to find her. Roll and bounce across the tiles to make them flip and vanish. When all tiles have vanished, the exit will open and you can leap to the next level. There are lots of different tiles too: tiles that need two or three rolls to flip them, tiles to push or bounce you around, smooth or rough tiles that affect how slippery the level is, and more. There are bonus rounds, and special bonus games that become unlocked as you play, in this charming, beautiful game that will test your mind as well as your reflexes. Yinyang uses the latest version of my game engine, Hector, to support the most up to date graphics hardware and game controllers.